Shop the best watch winders & cases and showcase your pieces in style! 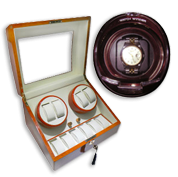 Our collection includes single, double & multiple watch winder cases, cover trays & display boxes, in many styles & shapes, such as rosewood & burlwood cases, leatherette & glass top items. All pieces at affordable prices thanks to our wholesale deals.